A launch readiness review Friday cleared an Ariane 5 rocket for liftoff Tuesday with two communications satellites for Arabsat and India, the first three missions from Europe’s spaceport in French Guiana scheduled in less than 40 days. 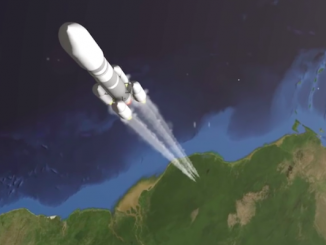 The heavy-duty rocket, standing 180 feet (55 meters) tall, will emerge from the final assembly building at the Guiana Space Center on Monday for a 1.7-mile (2.7-kilometer) journey on rails to the spaceport’s ELA-3 launch zone. After the Ariane 5’s arrival at the launch complex, ground crews will connect the rocket’s mobile launch platform to ground electrical and propellant supplies ahead of Tuesday’s launch countdown. Liftoff is scheduled for 2134 GMT (4:34 p.m. EST) at the opening of a 43-minute launch window. Technicians in the last few weeks fueled the mission’s two satellite payloads — Arabsat 6B and GSAT 15 — and attached the spacecraft to the top of the Ariane 5 launcher. 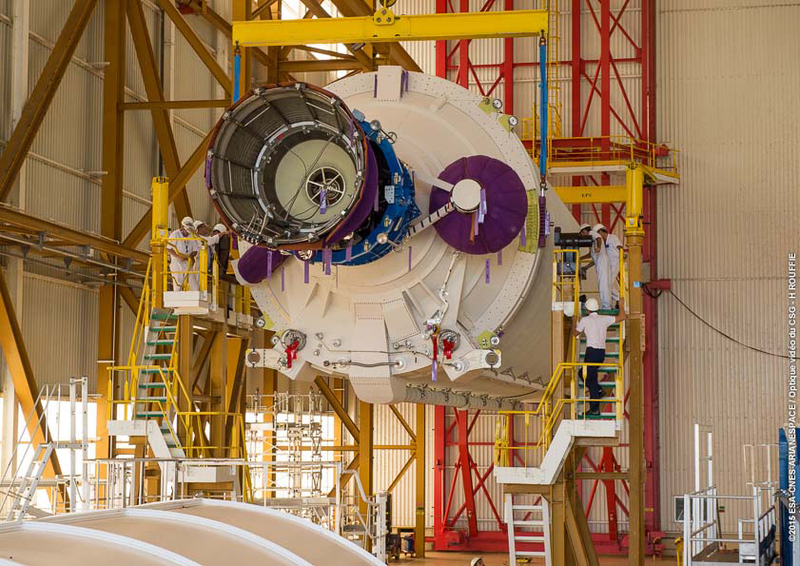 Arabsat 6B, the larger of the two satellites, was first encapsulated inside the rocket’s 17.7-foot (5.4-meter) payload fairing. 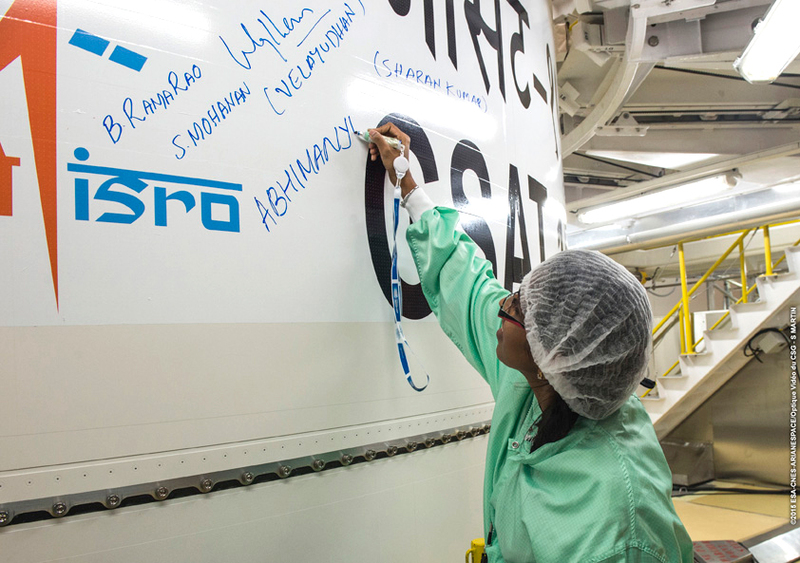 Engineers then attached India’s GSAT 15 communications satellite atop the Ariane 5’s second stage, followed by the lowering of Arabsat 6B inside the rocket’s nose shroud over the Indian craft Nov. 2. Officials conducted a final launch rehearsal and armed the rocket for flight last week, then convened a launch readiness review Friday, according to Arianespace, the Ariane 5’s commercial operator. Tuesday’s launch will be the sixth and final Ariane 5 flight of the year, but Arianespace plans two more missions from French Guiana before the end of 2015 using the light-class solid-fueled Vega booster and the medium-lift Russian Soyuz rocket. A Vega rocket is set for liftoff Dec. 2 (Dec. 1 in the U.S.) with the European Space Agency’s LISA Pathfinder probe, a testbed for measuring gravitational waves in space. Arianespace’s 12th and final flight of the year is scheduled for Dec. 17, when a Soyuz rocket will blast off with another pair of European Galileo navigation satellites. 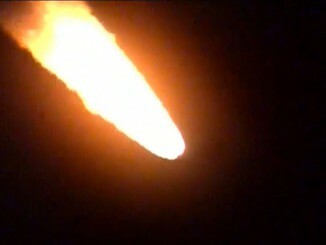 But first comes Tuesday’s mission, which begins about 20 minutes after sunset at the Guiana Space Center with ignition of the Ariane 5’s hydrogen-guzzling Vulcain 2 main engine, followed seven seconds later by the simultaneous firing of two 103-foot-long (31-meter) strap-on solid boosters to drive the rocket from the launch pad. 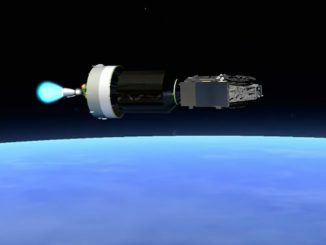 The twin boosters will burn more than two minutes, accelerating the Ariane 5 past the speed of sound before jettisoning to fall back into the Atlantic Ocean east of the space center in Kourou, French Guiana. The cryogenic main stage will fire for nine minutes, then give way to an upper stage HM7B rocket engine to hurl the dual-satellite payload into geostationary transfer orbit. The target orbital parameters for Tuesday’s launch, designated VA227 in the Arianespace flight sequence, are a low point, or perigee, of 155 miles (250 kilometers), an apogee, or high point, of 22,236 miles (35,786 kilometers), and an inclination of 4 degrees. Deployment of Arabsat 6B, riding in the upper position aboard the Ariane 5, is expected at T+plus 27 minutes, 21 seconds. A few minutes later, the rocket will dispose of a Sylda payload adapter to reveal GSAT 15 for separation at T+plus 43 minutes, 24 seconds. The satellites will use on-board propulsion for orbit-raising in the weeks after launch, eventually reaching circular geostationary orbits over the equator. Arabsat 6B, to be renamed Badr 7 once operational, is set to begin at 15-year mission to link the Middle East, Africa and Central Asia with telecommunications services and television broadcasts. 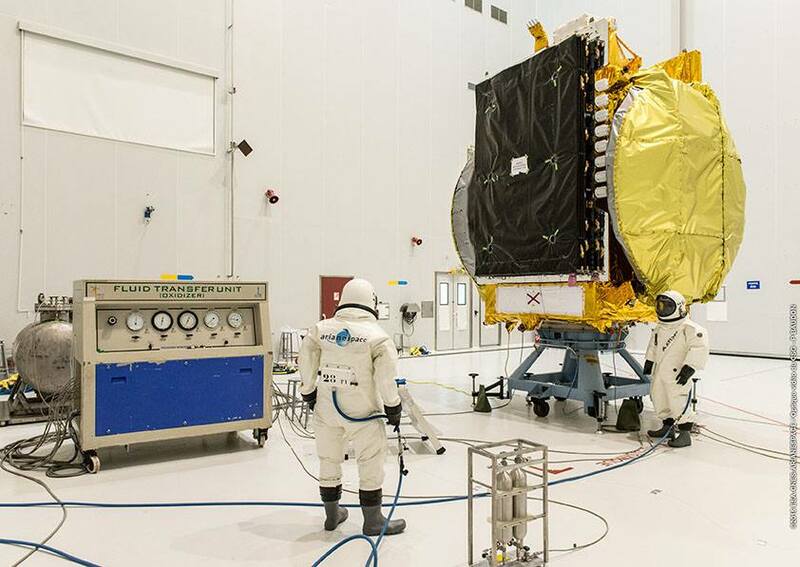 Owned by Arabsat of Riyadh, Saudi Arabia, the satellite is heading for a final operating position in geostationary orbit at 26 degrees east longitude. The 12,782-pound (5,798-kilogram) spacecraft is based on the Eurostar E3000 platform manufactured by Airbus Defense and Space, and hosts a communications payload made by Thales Alenia Space with 27 Ku-band transponders, 24 Ka-band beams and additional Ka-band transponders. GSAT 15, with a launch mass of 6,975 pounds (3,164 kilograms), is fitted with 24 Ku-band transponders to beam telecom services across India from a post at 93.5 degrees east longitude. The satellite was built and is owned by the Indian Space Research Organization. Designed for a 12-year lifetime, it carries a navigation payload to augment GPS positioning signals over India, and Indian authorities could use the satellite for emergency communications needs. It replaces the Insat 3A spacecraft launched on an Ariane 5 rocket in 2003.